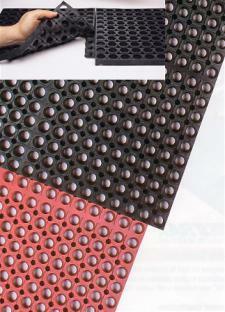 Anti-fatigue mats are another way to promote safety. Employee safety should be one of the top concerns of running a business, and warehouse managers need to take it seriously. It’s critical to make sure the working environment is a safe one for all employees, and it starts with raising awareness to hazards. Modern Materials Handing reports signage is critical in alerting workers to potential safety hazards. The news provider reports you need to make sure that when hanging up signs to warn of dangers, you need to ensure that all employees understand what the signage means. Consider holding quizzes during your regular safety training, and be sure everyone is on the same page with the right answer. In addition to having proper signage around, there are other ways you can make safety a priority for those on the job. Making sure the floor is clear from any slipping hazards can really bolster employee safety. Whether due to a spill, general wear or residue brought in due to foot traffic, slipping on the job is a big safety hazard, according to the Occupational Safety and Health Administration. Hazard signs can alert passersby, but it’s also a good idea to have anti-fatigue mats on the floor, as they provide extra grip that helps prevent people from falling.